Thoughts on the Journey: Cracks are where the life gets in. Vulnerable, not something most of us like to be, I'm terrible at opening up to people, even to my wife sometimes. The enemy puts all kinds of junk on us to try and crush us and keep us under his thumb. Our nature is for self-preservation, self-protection, self-reliance, self-esteem and selfishness so it's easy for him to keep us in that spot, it's easy for him to keep us fighting a battle we're never going to win on our own; keep us focused on us and him so we never think to turn to Jesus for help, or to a friend for prayer or to a church for support. Being vulnerable means we open up spaces in our self to be hurt; physically, emotionally and spiritually. No one wants that so we often choose to build the fortress that attempts to protect us from the possibility of being hurt. 'If I just become guarded and independent and strong and unreliant the enemy can't defeat me, the people around me can't cause me harm. Unfortunately this really only leads to two outcome. a) we attain that lofty mission, we become cold, lonely and self-righteous or 2) we miss a spot in the wall, a little crack, a back ally way, a secret tunnel we'd forgotten to back-fill and our fortress eventually falls. The enemy is sneaky, he'll find the crack. The enemy is dark, he'll sneak down the ally and you won't even see him coming. The enemy is dirty and persistent, he'll crawl on his belly in the mud until he gets through that tunnel. He's tricked the world into thinking that self-anything is the greatest goal, the highest importance is self-whatever. He hasn't tricked the world into thinking God doesn't exist, he's just tricked it into thinking self is greater than Him. But God’s nature is greater than our enemy or our nature; his nature takes the place of our self-nature if we ask him for help. When that happens - when God shows us that He is Love, we start to understand that by his power and spirit in us - God lets us experience what love really is and we're able to be vulnerable with him. His spirit and power in us teaches us that he's never going to hurt us, he's never going to let us down, so we can become more and more dependent, reliant and open to him. We hear his voice more clearly, we know what his plans are for us, we know his love. He begins take apart those walls we build to keep the enemy out, because they were keeping him out too. But as Leonard Cohen says "There is a crack in everything. That's how the light gets in." If you make yourself vulnerable to him, his light will flood your heart. Jesus is light. Bill Johnson says light doesn't debate with darkness, when light comes on darkness goes away. It's that way with Jesus. The more you become vulnerable to him, the more you say, 'Jesus I trust you are good, I trust you love me', the more he will flood your heart with light. Darkness will flee from you; the enemy will go back to crawling away in the mud. He might keep throwing mud at you but Jesus will keep on washing it off. You'll experience total safety in the midst of danger or fear or trial or pain. You'll experience freedom in the face of temptation and persecution and failure or loss. But you won't only experience it with Jesus, you'll start to feel so safe, you'll know his love is so strong, you'll know his power is so great - beyond anything you can imagine - that that vulnerability will start to spread out to people around you; people you pray with, people you worship with, people you live with, people you work with. You'll choose to make yourself secondary, you'll choose to make yourself lesser, you'll choose to make yourself available. You'll choose to share how Jesus changed your heart, how he got you through, how he forgave your mistakes and failures. Someone else will experience that same floodlight that got through your cracks because someone else knowing Jesus will be so much more important than your reputation or your safety or your self. Your venerability empowered by Jesus will not be a weakness at all. 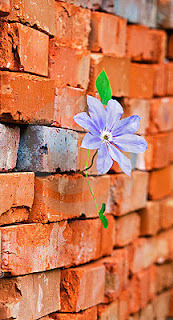 He'll fill those cracks in your walls and He will become your greatest strength. The cracks in your walls will start to bring life.